Day Four began as an after-midnight continuation of Day Three, as our Formula De match roared past the witching hour. Jeff generously donated his copy of the Formula De poster to the winner of the match, who turned out to be Stephen after a long back-and-forth battle for pole position with Island Mike. 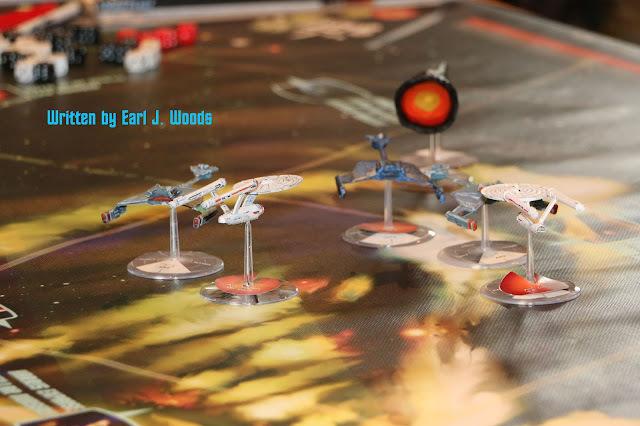 After spending the morning shooting the official G&G group photo (see a later post for that), Steve and I unveiled a surprise scenario for this year's Star Trek battle. 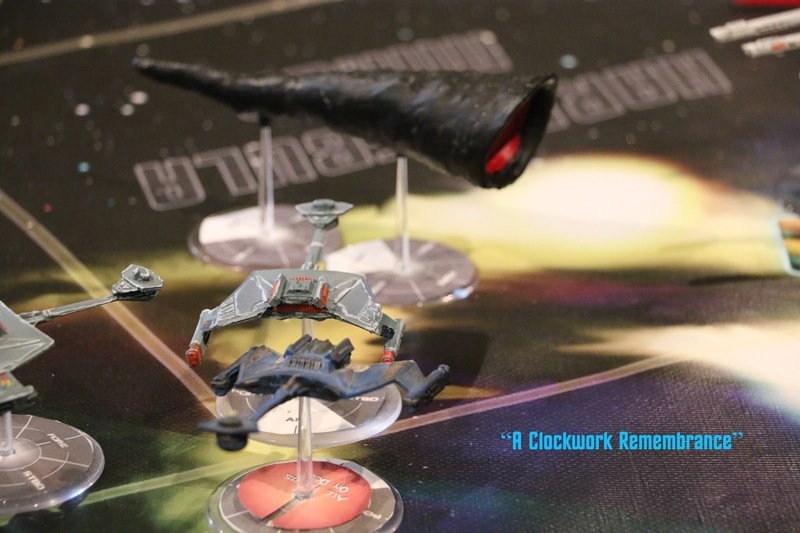 What began as a typical battle between the Klingons and the Federation turned into a desperate fight for survival as Steve and I took our own ships off the board and replaced them with Doomsday Machines! My original idea was to have the Borg travel back in time to assault our fleets, but Steve pointed out that there was an existing Doomsday Machine scenario we could modify to suit a similar, but more thematic, purpose. I ordered and painted the two Doomsday Machines seen here. One model is only half the size of the other because the first one I ordered was the wrong scale. Stephen's glib explanation: "It's further away." Fleet: Two Planet Killers (630 points) versus three Klingon D7s and three Federation Heavy Cruisers (1,080 points). Scenario Rules: The objective for the Planet Killers is to score 75 points of damage on plant and its inhabited moon. The objective for the defending fleet is to destroy the Planet Killers before they destroy the planet. The players controlling the Planet Killers cannot communicate, coordinate or strategize with each other. Game Length: The game continues until either the Planet Killers are destroyed or the planet is destroyed. Victory and Defeat: The Planet Killers must deal 75 points of damage to each target—Seamus and Kildare—to destroy them. The defending fleet must prevent this. 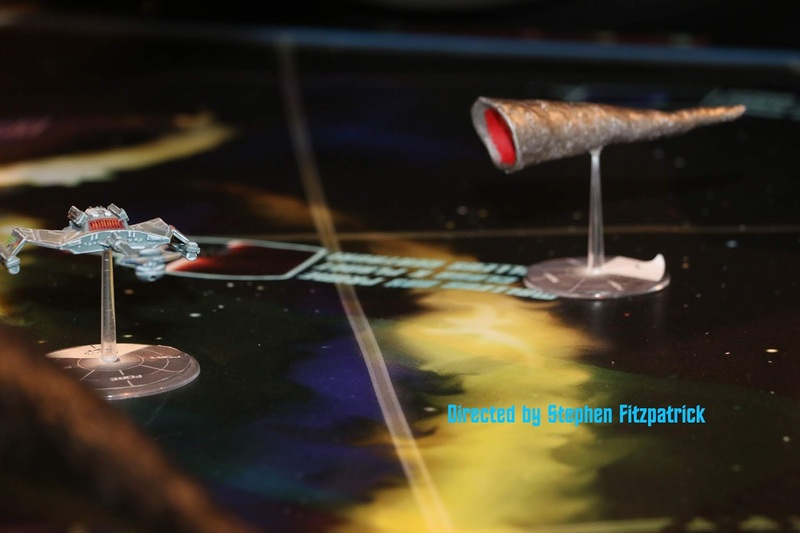 Setup: Begin play on the official Gaming & Guinness IX A Call to Arms: Starfleet map. Place planet Seamuis and its moon, Kildare, in close proximity to each other, twelve inches away from one short edge of the map. Place four Klingon D7s and four Federation Heavy Cruisers near the planet and its moon by using scatter dice to determine the opening distribution of ships. “Captain’s Log, Stardate 3120.6. Excalibur, Intrepid, Poltava and Potemkin are engaged in battle with four Klingon D7 cruisers just a parsec away from the Harp Nebula. “The Klingons are attempting to destroy our dilithium mining operation on planet Seamuis, along with Starbase 91, located on its Class-M moon, Kildare. Then, Steve steps in to describe a shocking turn of events: the Excalibur explodes and he removes it from the map, replacing it with the small Planet Killer. An instant later Steve removes the Black Dog, describing it as engulfed in a brilliant flash of white light. Then, he deploys the small planet killer. Once Steve has deployed his ship, Earl deploys the large Planet Killer. While the other players are letting this sink in, we will ask each remaining player to roll 2D6 shield and 1D6 hull damage to represent the effects of the battle so far. Steve and Earl will explain the true scenario rules, and the real battle will begin. The two planet killers move in. Past enmity laid aside, the Klingons and Federation decide to tackle one doomsday weapon first en masse. As it turned out, the Doomsday Machines were dispatched with relative ease, too slow to get to their targets before being whittled down by heavy numbers. Were we to do it all again, Stephen and I would have started our ships much closer to our objectives, which would have provided more challenge to the other players. Even so, it was a ton of fun and a nice change of pace. Labels: Formula De, Games, Gaming and Guinness, Jeff P., Mike P, Mike T, Pete, popular culture, Rob D, Scott F., Star Trek, StarFleet: A Call to Arms, Stephen F.